Lighthouse Park visitors deal with closed bridges by moving and ignoring signs. Months have passed without repairs. Octagon resident Scott Piro brings a refreshing activism to his role as a RIRA Common Council representative. At Thursday's RIOC Board Meeting, he used public comment availability to continue efforts to promote safety awareness along the East and West Promenades. In the last weeks of August, Piro worked with RIOC to end a practice of employees parking vehicles illegally, blocking the Promenade outside 680 Main Street, RIOC's Operations office. For years before Piro's push, thoughtless State employees forced runners, walkers, bikers and parents pushing strollers to dodge carelessly parked cars with New York State government license plates. An annoying hazard many of us accepted as "RIOC being RIOC" ended through Common Council intervention and senior management cooperation. At RIOC's September Board Meeting on the 6th, Piro thanked the State agency and especially Public Information Officer Alonza Robertson for support. Capitalizing on the established cooperation, he stepped forward with two other Promenade hazards. First, he wants RIOC to "limit fishing to designated areas along the Promenade." In narrower areas, "fishermen and women," together with their poles, "extend halfway across the Promenade, blocking joggers, strollers, pedestrians, skaters and so on." Most, if not all, have multiple lines in the water, resting the poles on the paved pathway while waiting for a telltale tug suggesting a fish has taken their bait. Piro also brought up a fear that many of us running along the East River have experienced - that of getting accidentally stabbed by hooks while fishers cast lines into the currents. When I ran the Island, it was a daily concern in a season that lasted for around six months. Another issue brought up by the Council Member is smelly, discarded bait that can make dogs sick. Piro asked that fishing be restricted to wider areas of the Promenade where lines can be cast and watched with less risk to other users, specifying stretches at the tip of Lighthouse Park and sections where green space separates the seawall from the Promenade. Broken bridges over the small causeway in Lighthouse Park, a danger raised by The Daily in an article last week, also got his attention. 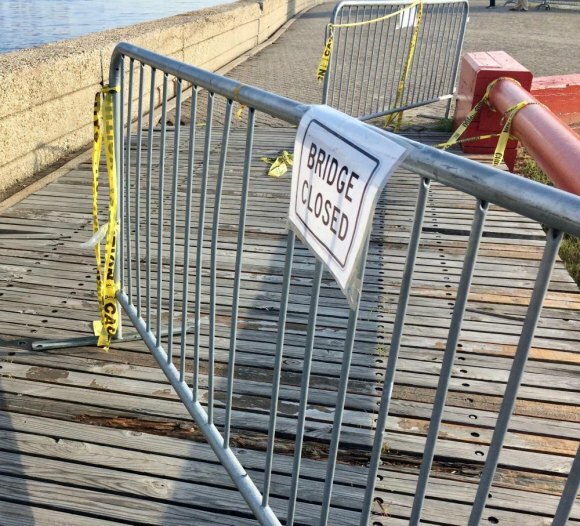 "Despite signs posted that they are closed," Piro said, "people continue to walk on them." As is their custom, the Board did not respond immediately to Piro's requests for an update on bridge repairs or on fishing restrictions.